A rally car on a course. Getting into rally racing calls for a significant amount of commitment. It takes high-performance driving skills, time, dedication and money to either purchase or build a rally car. It's crucial not to go into it blind. At the very least attend several rally events as a spectator first. When you're ready to get your feet wet, prepare to take some training classes, learn the rules and obtain a car before entering events. Before diving into rally racing, it's a good idea to get some behind the scenes experience, make some connections and find out what you're in for. Rally America recommends doing this by volunteering at a rally event in your area. As a volunteer you'll get a sense of what's involved and have the opportunity to meet rally officials, drivers and teams. This gives you an opportunity to ask questions and obtain guidance from experienced drivers. 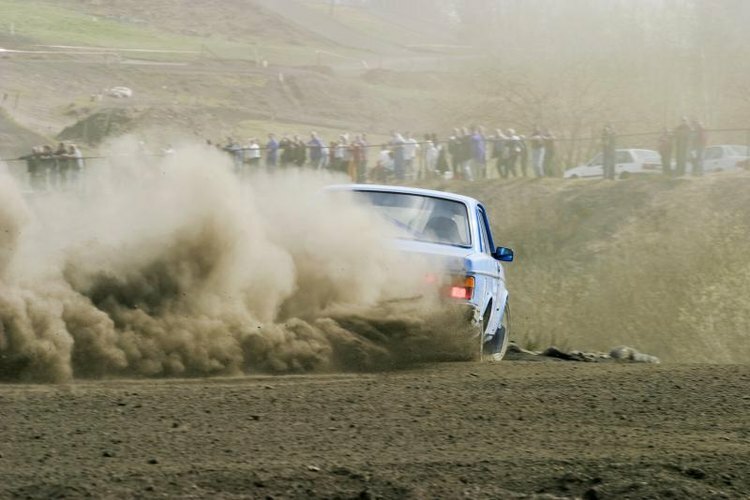 To race in rallies, your car must adhere to strict rules and regulations. Prior to jumping into building or buying a rally car, read the rule book for the rally events you intend to race in. Each class of cars must be within a certain weight, have a certain engine displacement and have no unauthorized modifications. Other requirements are outlined for wheels, door locks, air bags, mud flaps, door panels, exhaust system, roofs and lights for each class. All cars are inspected prior to races to make sure they are within the guidelines. Once you have gained a thorough knowledge of the rules and are confident that rally racing is what you want to do, it's time to obtain a rally car. One major decision is whether to purchase or build your rally car. Purchasing a rally car that is already built to specifications saves time and money compared to building one yourself. It's recommended that you start with a beginner-friendly two-wheel drive car, such as the Volkswagen Golf, according to Rally America. Once you have a car and are ready to start racing, it's best to first attend a rally training school in your area. The classes are taught over the course of a few days and you'll learn solid rally racing skills. Once you complete training, all that's left is to purchase a rally license, which enables you to start entering events. Rally America and the National Auto Sport Association, sanction most of the events in the United States. You must also have a membership to one of these rally organizations. Membership costs about $45 and the license is around $65.